A few weeks ago I stayed with some friends in Boston and my lovely hostess not only fed me delicious home-made food from her native Turkey, but also gave me a Turkish cookbook. I simply adore collecting cookbooks, and this one in particular was a gem as I had never made anything from that particular cuisine. As soon as I was back home I tackled lentil soup and, upon the success and popularity it enjoyed with the Mister, moved on to rice pilaf. I love, love, love rice. I had a falling out with it as a child for some reason I can neither remember nor fathom at this point, but nowadays I wish I could have it at every meal. Discovering that rice is as revered in Turkey as it is in my household, made me an even bigger fan of the newest addition to my library and its author, Özcan Ozan, who devotes an entire section to that grain. 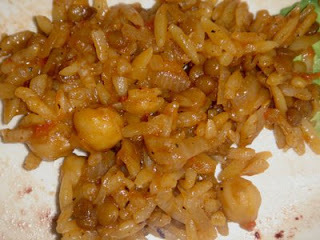 Here, adapted from The Sultan’s Kitchen, A Turkish Cookbook (Periplus Editions, 2001) is müceddere or, rice pilaf with chickpeas, green lentils, and caramelized onions. Do try it – it’s perfect for dinner at home but special enough for guests. Soak the chickpeas overnight. The next day, drain them and bring them to a boil in 2 C. of water along with ½ tsp. salt. Simmer for about 45 minutes until tender. Add more water during cooking if necessary. *This can be done a day ahead or early in the morning. In a separate pot, cook the dried lentils in about 1 ½ C. of water, just until tender. Set aside. In a saucepan, heat the oil over medium heat and add sliced onions, sugar, salt, and pepper. Cover the pan and cook about 5 minutes, until the onions are tender. Uncover the pan, increase the heat to high, and stir in lemon juice. Cook, stirring, until onions are browned. Add the cumin and red pepper and cook another minute or two. Next, add the rice and orzo, and cook about two minutes. Add the tomatoes, lentils, chickpeas, and stock. Season with salt and pepper, lower heat, and cook, covered, about 20 minutes until all the liquid has been absorbed. Stir in the chopped parsley and let stand, covered, 5 minutes. Serve. *I only used 2 tsps. of cumin because I was worried the flavor would be overwhelming. **I find American tomatoes to be completely tasteless, regardless of how ripe they may be. I prefer to use whole, canned tomatoes.